Red Elk Lodge - private setting close to town. Open design, propane fireplace. Cozy furnishings with southwestern flair. Deducted dining area. Nicely equipped kitchen. Bright dining nook with deck access. Reading nook off of kitchen area. Guest 1/2 bath too. Main level bedroom with queen bed and attached bathroom. Attached bathrom with walk in shower. Walk in shower. Stairwell to loft area. Loft area has two single beds. Open and bright. Open loft. Stairwell to basement level. Game room has air hockey, card table and big screen TV. Basement level guest room 1 with queen and twin bed. Basement level guest room 1 with twin bed. Basement level, full size bathroom. Basement level guest bedroom 2 with queen bed. Basement level guest bedroom 3 with queen bed. Air hockey. Wet bar in basement level lounge. Game room has air hockey, card table and big screen TV. Basement level has cozy furnishings and outdoor patio access. View from deck South east facing deck. Lovely, three level log construction home with a rustic southwestern flair. Savor a Red Elk Lodge sunrise or sunset and lounge in comfort year-round on the covered, wrap around deck. 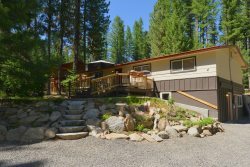 Well situated on a large lot for privacy and in a quiet neighborhood, this mountain getaway is just minutes from McCall, Payette Lake and river access. Welcome up to 10 guests in this comfortable home that has four bedrooms and 2 ½ bathrooms. Main level has one private master bedroom with queen bed and an attached bath with walk-in shower. Lower level has three, private bedrooms each with a queen bed (plus 1 twin) and hall access full size bathroom with tub/shower combo. The kids will love the bunk room loft with two, twin beds and kid sized play area and peek-a-boo half wall so they can keep an eye on the grownups. Nicely equipped kitchen with gas stove and cooktop and tea for two counter seating, bright breakfast nook and dining area. Cooks will love the deck access adjacent to the kitchen! Living space lounge has a propane fireplace and deck access. A guest bathroom is privately located adjacent to a cozy alcove reading nook. Get your game on! The spacious daylight basement with lower level access to the covered patio is a combination lounge and game room with air hockey, movie screening area, fridge and wet bar. Two private bedrooms are located on this level with a full size, hall access bathroom. Utility room and laundry are also located on this level. Year-round recreation in any direction – ski, board, boat and ride. Brundage Mtn. is just 15 minutes away and Nordic skiing at Bear Basin and Ponderosa State Park is even closer. Unpaved driveway can accommodate a trailer (during warmer months). PLEASE NOTE: Guests do not have access to detached garage, and trailer parking in the Winter may not be an option depending on snow accumulation. Thinking of making it a reunion? Bring the whole family and rent two houses – we have several properties on this street. PLEASE NOTE: Unpaved driveway can accommodate a trailer (during warmer months). Guests do not have access to detached garage, and trailer parking in the Winter may not be an option depending on snow accumulation.